Boxed set, like new, never used. Over four thousand years ago, the Sumerians built the world's first cities near the fertile floodplains of ancient Mesopotamia, or Babylonia, as it would later become known. Their sophisticated civilization was so influential that elements of Sumerian culture, including their mythology and alphabet, would survive for millennia. Traces of Babylonian myth can even be found in the Hebrew Scriptures and, according to Golden Dawn Adept and Tarot artist Sandra Tabatha Cicero, the powerful deities and mysterious incantations of this ancient culture can also be seen as the very root of Western Ceremonial Magick. 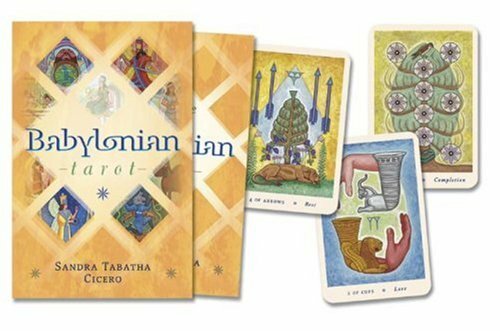 Babylonian Tarot is beautifully original in concept and design, yet faithful to tarot tradition. The only tarot deck based on the Sumerian mythos, it includes five extra cards-one Trump and four court cards-yet retains the traditional zodiacal, elemental, and planetary associations. The accompanying guidebook includes detailed descriptions of each card, as well as instructions for using the deck in magick and divination.